We just received updates that hordes of mysterious figures wearing masks are seeking out and attacking Redpills. We are unaware of the source that is directing this faction, and so it is suggested that all Operatives proceed with extreme caution. If you are approached by any of these masked figures, consider them to be a threat to you and defend yourself. We have no information on their purpose. It is our request that all Operatives investigate their activities and figure out what it is they seek. Once Operatives gather a complete set of data on these masked men, proceed to the Machine Collector and deliver all that you have acquired. Proceed with caution. Your history has proven you to be efficient at completing similar tasks and the Agents are confident that you will acquire the information necessary to determine the motives of these individuals. At this time we are aware that Morpheus remains at large. He recently broadcasted a message that indicates his true position against the Machines. It is evident that Morpheus never had any desire to maintain the Truce as his contentious agenda indicates. 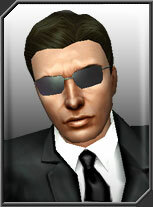 The requests for Mr. Anderson’s body continue, and as we stated before, we do not deal with terrorists. We are unsure if the masked figures are in some way allied with Morpheus. It is a possibility that they are operatives under the Merovingian, or they could be decoy Exiles. It is our collective desire to learn their purpose, while continuing our efforts to trace the exact locations of Morpheus. It is imperative that you conduct the investigation as to the origin and intention of these masked individuals, and share all that you discover amongst those serving the Machines.